This is a great selection of AutoCAD windows and AutoCAD door symbols. You'll find several door and window styles to choose from. 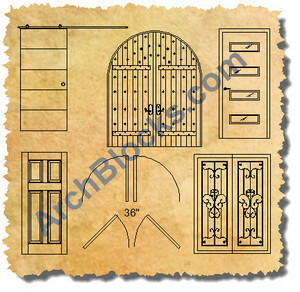 These architectural door and window symbols come in elevation view and plan view. The door symbols selection ranges from basic door designs to highly detailed custom wood doors.The window symbols also come in basic designs to custom arched window designs. 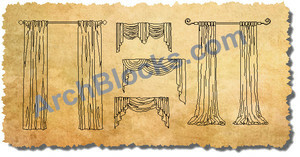 You will also find a beautiful set of window covering CAD blocks and window curtain CAD symbols that can't be found anywhere else! 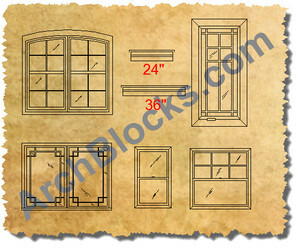 These CAD window treatment blocks will add style and beauty and detail to your CAD elevation drawings. 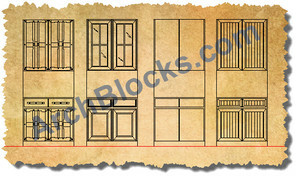 Be sure to check out the cabinet doors CAD block library! There are several CAD cabinet door styles to choose from.